Dominion Diagnostics, a leading national medical laboratory specializing in urine drug testing and actionable clinical information for addiction treatment and pain management, has launched a new mobile application for its customers utilizing smartphones and mobile devices. 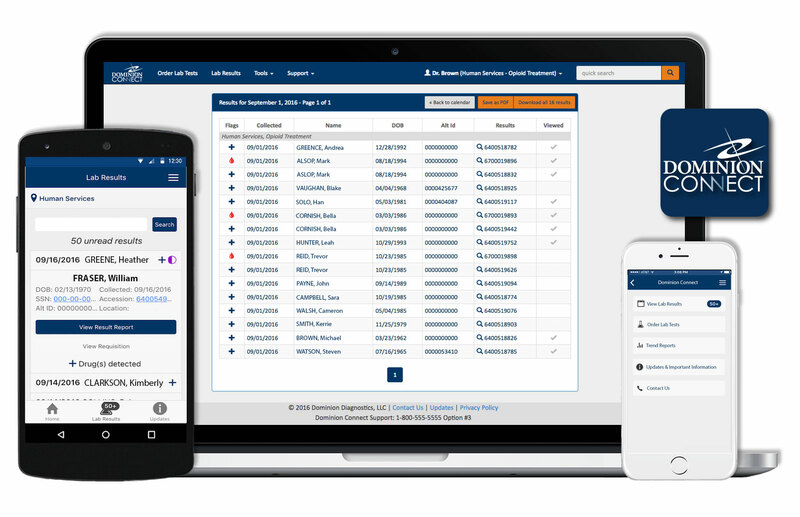 Developed to augment the company’s secure online portal for electronic orders, results and resources, the new application is called Dominion Connect™ MOBILE and is now available for download on the Apple and Google Play stores. Dominion Connect MOBILE works with Apple and Android devices, and allows for secured access to specific clinical information permitted by a user’s established privileges in Dominion’s online customer portal, Dominion Connect™. Patient laboratory results, clinical trend reporting, industry relevant resources, and contact information for key Dominion Diagnostics support teams are all accessible through the mobile app. Users have the ability to set custom alerts and notifications based on their preferences and clinical workflow needs. Enhancing access to critical testing results and clinical information resources is a top priority for Dominion Diagnostics’ Information Technology Development team. “Dominion Connect MOBILE is a unique clinical tool in our specialty and differentiates our company, and the level of service and tech-savvy support we offer to healthcare providers,” said Molusis. Future development is planned to further enable Dominion’s customers through Dominion Connect MOBILE. Dominion Diagnostics clients may find additional information and download links online here.